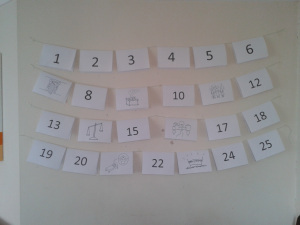 Hello, last year I posted this advent calendar which Rachel (the ‘If only I could turn back time’ mum) created with her husband. If you’d like the file I can email it to you. It’s a great way to get your children excited about God’s super-duper rescue plan this Christmas. Well isn’t this the most festive sight you ever did see? No? I know it’s doesn’t look great but please don’t be put off by the beige/white combo and the peeling paint which I’m trying unsuccessfully to hide! It’s actually completely marvellous! 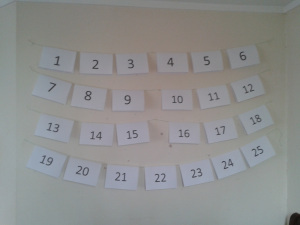 This is an advent calendar for young children, which my wonderful friends created and have kindly given to me. Each day you turn over the relevant day to reveal a picture (see the second photo), look at a Bible story together, maybe do a song and colour in the picture. Eventually your children will have built up their own colourful Bible overview! Brilliant!